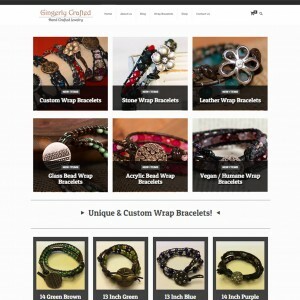 Project Description: Chelsea at Gingerly Crafted knew she wanted a website to sell her custom wrap bracelets and hand made jewelry. She had only 1 requirement, that the website reflect just how unique her bracelets are. For her we created a fully responsive eCommerce website where she lists her unique bracelets and other hand made jewelry. We taught her how to update her products on her own time and she quickly populated the website.